With their long golden coats and friendly face, they are a favourite pet across the UK. But yesterday all eyes were on a tiny Highland village, where the first ever Golden Retriever was bred. Dozens of the dogs and their owners gathered in Tomich in Inverness-shire to celebrate the area’s strong links with the breed, and to see a statue unveiled in their honour. 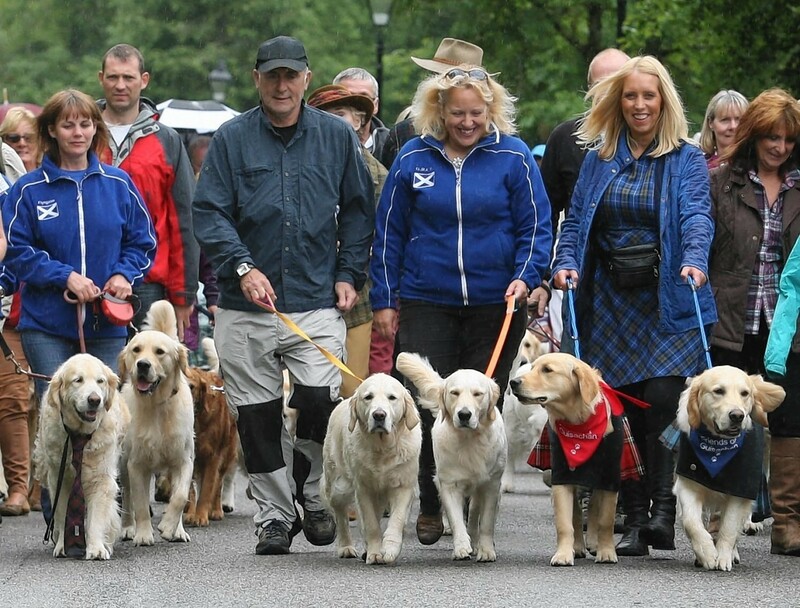 The pack paraded along the village’s only street led by a piper to the life-size memorial, which has been erected on the Guisachan Estate – where it is said the golden retriever was first “created”. In 1868, the estate’s owner, Dudley Marjoribanks – who later became Lord Tweedmouth – crossed a wavy-coated retriever with a tweed water spaniel to produce three golden coated puppies. Yesterday distant cousin, Andrew Marjoribanks – chieftain of the Marjoribanks clan – honoured his ancestor at the unveiling of the statue. He said: “It’s been a terrific day, never mind about the rain. It is amazing to think that 150 years after he started the breed is popular all over the world. The £18,200 bronze statue was commissioned by the Friends of Guisachan, and is based on golden retriever Michael of Moreton, who won many titles and sired many champions. He was selected to represent the breed at its half-way point of development, as he sired many prize-winners both in the UK and US. The cost was met by golden retriever clubs and enthusiasts in Scotland, England, Ireland, America, Australia, Tasmania and Canada. The statue, which is about 5ft 6in tall, stands near an existing monument to Lord and Lady Tweedmouth.